In January, I attended a meeting of the Greater PortlandChapter of the Maine Genealogical Society. During the meeting, there were some questions about software to use to manage genealogical information. I had several suggestions for PC Users, but told folks there were not any free products for the Mac. What do you know, a week later MyHeritage announced free download for Family Tree Builder (FTB) for the Mac. I thought I’d give it a try, sort of kick the tires and check the engine for leaks. Over the years I’ve used many products, Family Tree Maker (FTM) for Mac (Orig, 2, & 3), Heredis, Mac Family Tree, also Reunion, so I have experience with several genealogy programs. I already had an account with MyHeritage so downloading and installation was easy. I would have had to register with MyHeritage if I had not already done so; registration is very easy. The installation followed typical Mac installation processes – download DMG, execute the DMG, drag the icon to your applications directory and then launch the program. I was disappointed that the file system and the interface was very (Microsoft) Windows like. It took me a bit to figure out how to find my GED file, which I had created earlier, in order to import it. I am so out of practice using Microsoft Windows. Likewise, the software interface with its buttons was very Windows-like and not at all Mac-like. I finally imported the file and learned that I had quite a few errors occurred in the import process. Nothing told me how important the errors were — Oh well. I was unhappy with the constant and regular nagging to purchase the upgrade. It seemed like everything I tried to look at was available in the Premium package. I learn quickly and learned how to keep away from those features. My real shock was when I tried to edit one of the entries. It reminded me about why I hate Microsoft Windows. 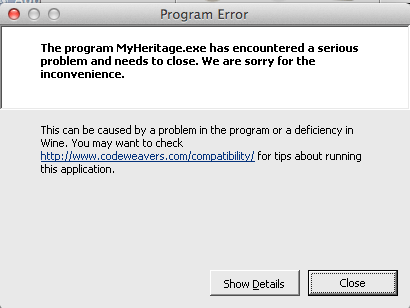 The message confirmed that the program is actually a Windows program running on a Mac by using Wine and probably some enhancements by Codeweavers’ Crossover. I had several more “Program Errors” during my use of the program. I restarted my computer, which seemed to mitigate the issues and I haven’t had as many “Program Errors” since the computer restart. I really liked many of the features in FTB. The data managed for living people was exceptionally good. In addition, because of MyHeritage’s Smart Matches, the program makes it very easy to contact other researchers. The photo management also seemed very good and included a feature for adding the reverse side of a photo, something that I liked seeing. The reports were okay but didn’t have the visual impact of some other programs I’ve used. MyHeritage has a really nice website creation process and includes many tools to increase genealogical awareness, including genealogy games for kids to get them interested in your family tree. It also handles writing stories and activities really well to make it more interesting to tell your story. 23 & Me now has a relationship with MyHeritage. 23 & Me is a DNA testing company. They used to have customers enter their tree on the 23 & Me site. They recently partnered with MyHeritage so that MyHeritage now maintains your family tree information and makes connecting with genetic cousins much easier. That feature could be a reason to use MyHeritage and/or FTB. The real issue with the software is that it is a marketing/sales product. The free version of the software, like the free version of the web interface on MyHeritage is limited to 250 individuals and 250 MB of storage. You need to upgrade to Premium to expand to 2500 individuals and to Premium Plus to go above 2500 individuals. If you are a Windows user of MyHeritage’s Family Tree Builder and are moving to the Mac, it is definite that the Mac version will ease your migration. If you are a MyHeritage subscriber, then Family Tree Builder will make many of the tasks and research easier to use. Its integration into MyHeritage research options is excellent. I haven’t figured out exactly what will happen if you drop your MyHeritage subscription and have more than 250 individuals in your tree. If you are a Mac user that really likes the Mac interface to programs, you will not like FTB. The bottom line is that FTB is a desktop application that improves interaction with your MyHeritage account and online trees. If you do not have a MyHeritage subscription, you probably do not want to use Family Tree Builder. Yes, FTB for Mac is not a native Mac software. I gave it a try and got stuck. Here is the issue. I made 5 entries. Then I wanted to edit one of my entries, but it will not give me an option for edit. This does not make sense. The online version at the MyHeritage site allows you edit each entry, but offline for Mac? I have no clue to solving this problem.